The Diabetes DTOUR Diet: The Revolutionary New Food Cure is written by Barbara Quinn, a clinical dietitian and certified diabetes educator, and the editors of Prevention Magazine. It is a six-week program targeted specifically to meet the needs of type 2 diabetics. However, the authors say that this book is not only for diabetics but also for anyone who is struggling with food cravings, excess weight and chronic fatigue, which may also be signs of an increased risk of developing diabetes. Quinn says, “many people prefer to ignore the fact that they may be at risk because they fear being forced to live a life of deprivation. Not true. The foundation of this program is an eating plan that highlights foods that are high in the “Fat-Fighting Four” – calcium, vitamin D, omega 3 fats and fiber. All of these components have been demonstrated in scientific studies to provide benefits for diabetes and fat loss. The book includes a detailed six-week plan where you will eat three meals and two snacks each day. The importance of frequent meals is emphasized because this will help to keep your blood sugar levels stable and energy levels high, as well as help to manage your appetite. Dieters are instructed to be aware of portion control for weight management. Low fat milk, light yogurt, cottage cheese, spinach, kale, broccoli, legumes, salmon, mackerel, turkey, chicken breast, flaxseeds, walnuts, peanut butter, tofu, legumes, omega 3 eggs, whole wheat bread, canola oil, olive oil. 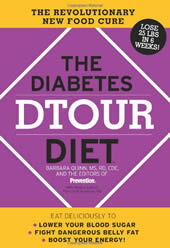 The Diabetes DTOUR Diet includes a fitness plan that is customized to suit your needs. You are encouraged to gradually increase your exercise intensity as your fitness improves. Walking is the foundation of the exercise plan and this is supplemented by a strength training routine. The Diabetes DTOUR Diet: The Revolutionary New Food Cure retails at $24.99. Specifically designed to meet the needs of diabetics. Meal plan created by a registered dietitian. May be used for prevention of diabetes for those with a high risk. May also reduce the risk of heart disease. Prevention magazine has a strong reputation in health and weight loss. Will not appeal to readers who are outside the target audience. Some recipes include artificial sweeteners and processed foods. Role of calcium in fat loss is not supported by all diet experts. Not suitable for those with allergies or intolerances to gluten and dairy. The Diabetes DTOUR Diet can assist those with diabetes and insulin resistance to lose weight and improve their blood sugar regulation. It involves a calorie and portion controlled diet that highlights the benefits of calcium, vitamin D, fiber and omega 3 fats for the management of diabetes. I am allergic to gluten but you can substitute that with rice flour based products or potato bread. The rice based products should have a low gi load.